In our second week of learning about the sacrificial system, we read about the laws of what is known as the korban tamid, or the daily offering. Our portion begins by telling us, “This is the law of the burnt offering” (Leviticus 6:2). The burnt offerings in this passage are not voluntary burnt offerings brought by petitioners, but rather the continual (tamid) or daily offerings required to be brought at the beginning and end of every single day: “One lamb you shall offer in the morning, and the other lamb you shall offer toward the evening” (Exodus 29:39). These two offerings serve as bookends to the daily services of the Holy House. They also serve as the basis for the daily prayer times. The morning prayers (shacharit) and the afternoon prayers (minchah) correspond to these two daily offerings. From this repetition we learn that there were at least three fires burning on the altar: one for burning the offerings, one for the coals required to be used while burning the incense on the Golden Altar, and one simply to ensure that there is a continual flame on the altar in the event the others should ever fail. It is this last one that we will now draw our attention to. There are a few applications we can derive from this command to keep the fire ablaze upon the altar. The first is the literal understanding. When there is a functioning Temple the fire on the altar must never go out. It must be tended to and stoked so that the flame of the altar should never be extinguished. The second application is that during a time when the Holy Temple is not functioning, the altar fire should be kept alive through our prayers. Every morning and afternoon during our daily prayers we recite the laws of the korban tamid that is placed upon the fire of the altar each and every day that the Holy House is functioning. Since we live in a time when the Holy Temple is not functioning, we metaphorically keep the fire burning upon the holy altar through this daily recitation. When the disciples of Yeshua encountered him on the road to Emmaus, their hearts burned within them as he taught them Torah. They said, “Did not our hearts burn within us while he talked to us on the road, while he opened to us the Scriptures?” (Luke 24:32). 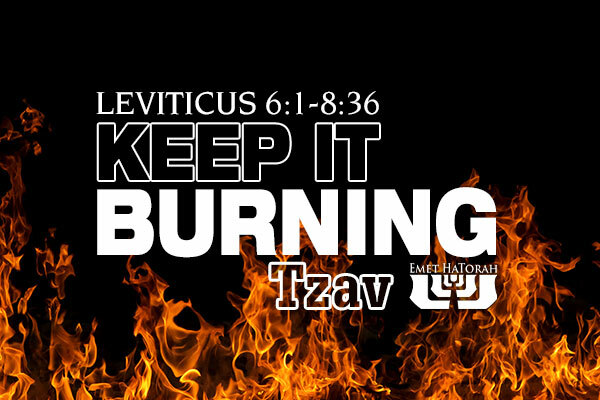 Our hearts should also burn with the words of our rabbi, igniting a flame within us for Torah and mitzvot. However, we cannot expect that flame to last indefinitely without attendance, so we must work diligently to assure its survival. What will you do today to keep the holy fire continually burning on your altar? What will you do to insure that it is not extinguished? What will you do to help your brother attend the fire on the altar of his heart as well?